(Tetun) Two new district thematic map sets – one with slope information, the other featuring elevation with a hillshade effect – have been added to Seeds of Life’s collection of over 1,800 maps. Each map works like an offline GIS map with layers of thematic information from the 2010 census that can easily be turned ‘on’ or ‘off’. 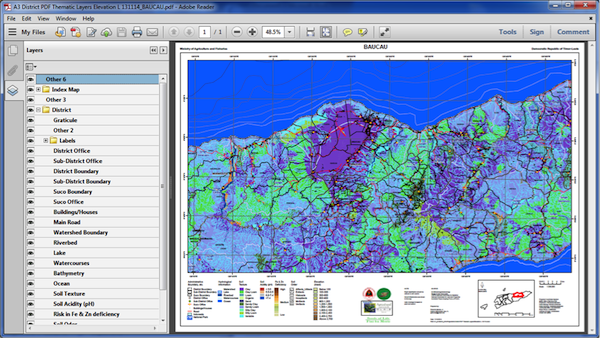 The maps have been prepared in two sets because it’s not possible to export/save two image (raster) layers in a pdf format. Hence, the first set uses slope categories as an image layer background and the second uses elevation with a hillshade effect. Simply choose which layers/labels to display by using the ‘layers’ function in the left pane of Acrobat Reader. You can also print each map layer separately. These map sets replace the previous district land use and slope maps on the SoL website, and are made available as high-resolution files (6 – 20Mb/file) for your mapping and development planning. This ensures un-pixelated images when you zoom in and out and allows you to print it in high quality. We welcome any feedback from you so we can make further refinements and improvements. Please email us at info@seedsoflifetimor.org.